"This recipe is for the serious cheesecake lover. It is very rich and definitely not low fat. It is best to prepare for dinner guests where a little slice will go a long way. I prefer to make it without the topping, but it is just as good with it. The longer you are able to refrigerate it before serving the better it gets. Enjoy!" 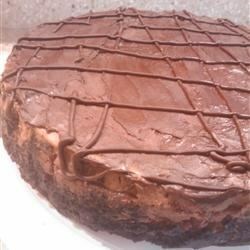 To make the crust, combine vanilla wafer crumbs, 2 tablespoons melted butter, 1 tablespoon sugar, and 1 tablespoon cocoa; toss with a fork to mix. Press into bottom of a 9-inch springform pan. Wrap the pan bottom in aluminum foil. Refrigerate while preparing the filling. Preheat oven to 350 degrees F (175 degrees C). Bring a kettle of water to a boil. Grate or finely chop the semisweet chocolate and put it into the top of a double boiler. Place over hot water. When almost melted, remove from heat and stir until completely melted. (Chocolate can also be melted in a microwave in 30-second increments, stirring frequently.) Set aside. Combine cream cheese and 1 cup sugar; mix with an electric mixer until well blended. Dissolve coffee powder in 2 tablespoons coffee liqueur. Add the coffee mixture and the cooled melted chocolate to the cream cheese batter; mix until combined. Add the eggs one at a time, mixing just until incorporated. Pour the filling into the prepared crust; tap the pan on the countertop to smooth the surface and settle the batter. Place springform pan in a large baking dish. Place baking dish on oven rack; carefully pour boiling water into the baking pan until it comes halfway up the sides of the cheesecake pan. Remove the pan from the oven, and remove the springform pan from the water bath; discard any remaining water. For the topping, stir together the sour cream, 2 tablespoons sugar, 1 teaspoon coffee liqueur and 1 teaspoon of cocoa. Spread over the top of the hot cheesecake. Return cheesecake to the oven for 5 minutes. Remove from oven and allow to cool to room temperature. Made this the night before for a coworker's birthday. It was really rich but totally delicious and the topping looked nice. I would definitely make this again.